I am trying to use custom dimensions to capture metadata of article postings (date, author, type, tags). I need to make an ajax call on page load to get this metadata, so I cannot send the custom dimensions (CDs) on page view. I can't see any data from my CDs outside of the Event metrics. I want to be able view the CDs with my other metrics (page views, bounce rates, etc.). Right now, I have a trigger set in GTM to fire on DOM Ready, which then kicks off my Custom HTML tag to retrieve the metadata to pass to the CDs. When that data is retrieved it is pushed to the dataLayer, matching the variable names used in GTM. I know that the data is coming through to GA as I can see it in the Events reporting. It just doesn't show up if I add any other metrics or dimensions. I have the CDs set at a Hit-level scope as I want them to be logged for each hit an article receives. Do the CDs need to be applied on a Page View Track Type for them to be used in reporting that way? This seems like a scope issue to me. Your custom dimension is scoped to hit which means it is only associated with the next hit that is sent (the event). Unfortunately if you want it associated with the pageview your only two options are to scope it to session (or user) or come up with a way to set the dimension before the pageview send. Perhaps there is another way to approach this? Maybe you could make a custom report that shows the event with this hit scope and add another dimension column of page (and others as desired)? Since the custom dimension is scoped to the event and the event is associated with the pageview you could transitively connect them... That's the only other way I can think to do it. Not the answer you're looking for? 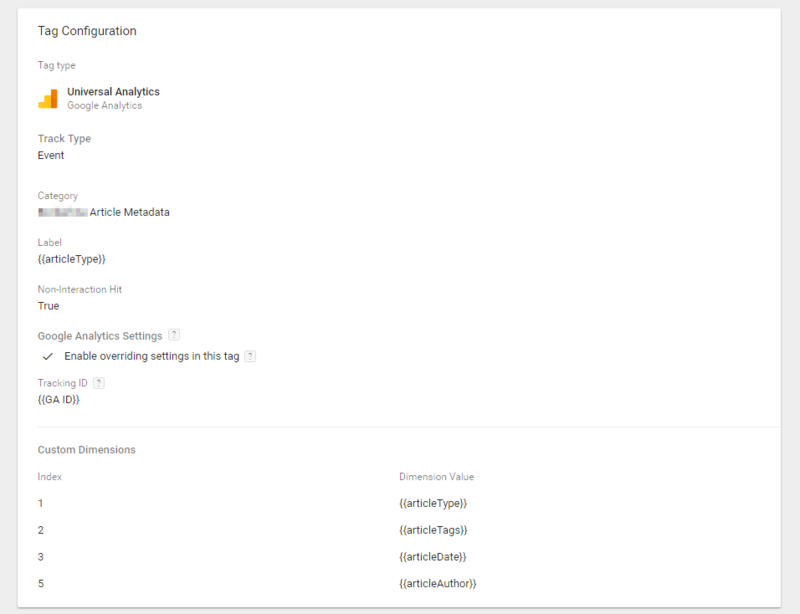 Browse other questions tagged google-analytics google-tag-manager reporting page-views custom-dimensions or ask your own question.